Have you already started selling on Facebook? Whether you have a FB store or just a FB business page, you may have heard about Facebook Business Manager. But that’s not all. This 100% free resource helps keep your business page more secure and allows you to delegate tasks without having to share your personal Facebook content with others. Essentially, it makes managing your business Facebook page more professional. In this post, we’ll walk you through the process for using and setting up Business Manager. Let’s get started. Why Use Facebook Business Manager? First things first: Let’s tackle the why behind using Facebook Business Manager in a bit more detail. 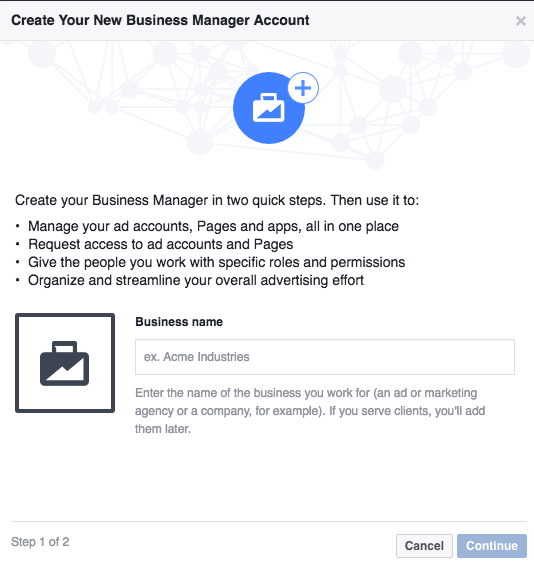 Facebook Business Manager helps manage access to Pages and ad accounts so that different roles and tasks can be assigned to different people within the organization. For the busy business owner, this means you can better delegate Facebook page duties and securely allow team members access to your business page. Business Manager allows you to grant access to Pages and ad accounts (giving the page admin full control over distributing and revoking page access) as well as to grant access to Pages and ad accounts without being friends with your team members on Facebook and the ability to run automated retargeted ads. 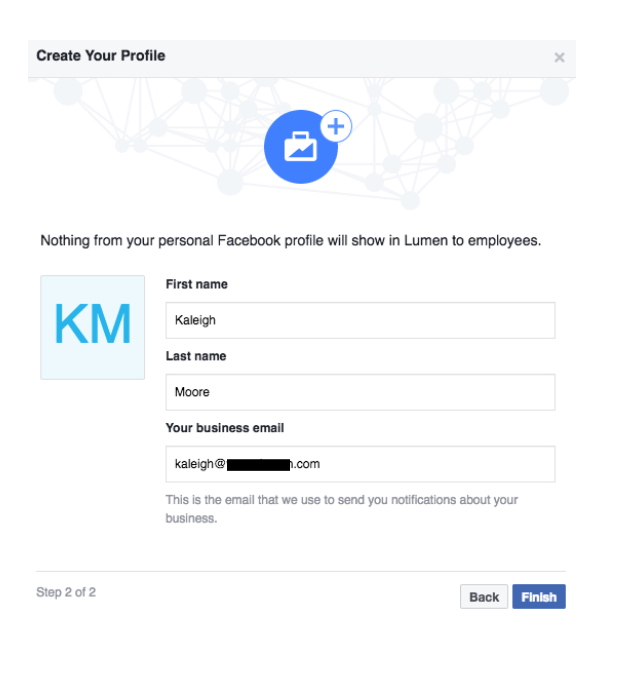 For the business that values privacy and likes to keep work life and personal life separate, Business Manager makes using Facebook more simple and a lot less awkward. Setting up an account for Business Manager is actually quite simple. Let’s break down the process into steps so you can see exactly what you’ll need to do to get started. A personal Facebook account to confirm your identity. An ad account you want to move to Business Manager. At least one business Page. Enter a name for your business, select the primary Page, and enter your name and work email address. If you don’t yet have a Page for your business, move through the rest of the onboarding flow by entering in all necessary and relevant information. Note: Facebook says that a Business Manager should always have a minimum of two admins so that access to the page isn’t limited to a single person. If a conflict arises, a single person can lock others out from the page — which can be a be problem. Click on Ad Accounts on the left sidebar. 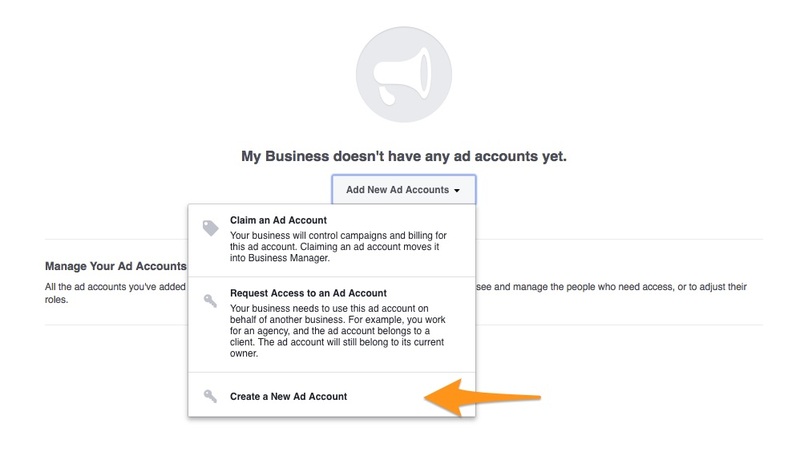 If you are new to Ad Accounts, create one by clicking the third option. Now you can delegate roles to employees and assign tasks by organizing the account. The page admin is at the top in the organizational pyramid (and is the only one who has the ability to assign out different tasks.) Below the admins are managers who can complete various tasks but don’t have full access to your page. Note: You can add new managers using their business email, but these users will still have to verify their account with a personal email account. Click on Pages or Ad Accounts (will vary based on what task you’re going to assign). Select the pages or ad accounts you want to grant access to. Click Add People and choose the manager(s) who get access to those pages or ad accounts. Now you can assign tasks like posting content, moderating comments, managing ads, etc. And that’s it! Once you’ve completed these four steps, you should be ready to go with Business Manager. If you still need help, check out Facebook’s Business Manager Guide which includes FAQs and troubleshooting resources for common issues. This frees you up to focus on other aspects of your business so you can grow the company and think big picture — rather than being stuck down in the daily details. And don’t forget to accelerate the growth of your FB business page by adding a full-featured online store!